We're just back from London. We flew in at the end of our holiday in North Cyprus for a few days and had a great time. We returned home exhausted but happy and Cooper extended his trip even further with a few days at his grandparents house. I thought it might be fun and hopefully helpful to share some of the activities we enjoyed in London to give you ideas for your next trip. Kidzania is amazing. Cooper loved it. It's basically a miniature city for kids. When they check in (grown-ups too) kids are given 50 kidZos to spend in the city and everyone is given a security wristband, so if a child gets lost or you lose sight of them for a minute, you can check at the security points around the city to see where they are. Inside the city there are more than 60 real-life role play activities for the children to take part in. Some of the activities cost money and in other jobs they earn money. They can save money from their jobs to purchase something from the shop or they can save it and open a bank account. This is good if you're planning return trips. They even get a bank card, so they can really learn about saving. PILOT: For this job he dressed up and was given a briefing before entering a plane cockpit. He chose to be the pilot and took part in a simulation to fly and land the plane while the other children were co-pilots and crew members. The crew members did the safety announcements while the pilots flew the plane. This was his absolute favourite role. MECHANICAL ENGINEER: For this activity Cooper once more dressed up, listen to a talk, helped build a car and went into the Pit Lane to learn to change the wheel of a race car really quickly. SUPERMARKET STAFF: Cooper was taken into the staff room for his uniform and training, then he was given a shopping list to follow before cashing it up at the till. Some of the other things he tried were making smoothies (with Innocent), making chocolate (with Cadburys), scientist, surgeon and fire fighter. I was amazed at how confident he was putting himself forward for jobs. It was lovely to see. Adults are encouraged to step back. The children, queue, say what they want to do and are signed in on their wristbands. They either pay at the start of the activity or collect their wage at the end. Parents can generally watch through a viewing window, but the children do everything themselves. There's seating and cafes for the adults while the children are having fun. At the end of their 4 hours, the children can bank their money or spend it. As Cooper didn't have enough, they let him work in the shop to earn more money and bought a pencil and rubber to take away. You can also stop at the photo shop and select photos of the day taken by the on-site photographers, choose prints or have them made into something. It was quite pricey. 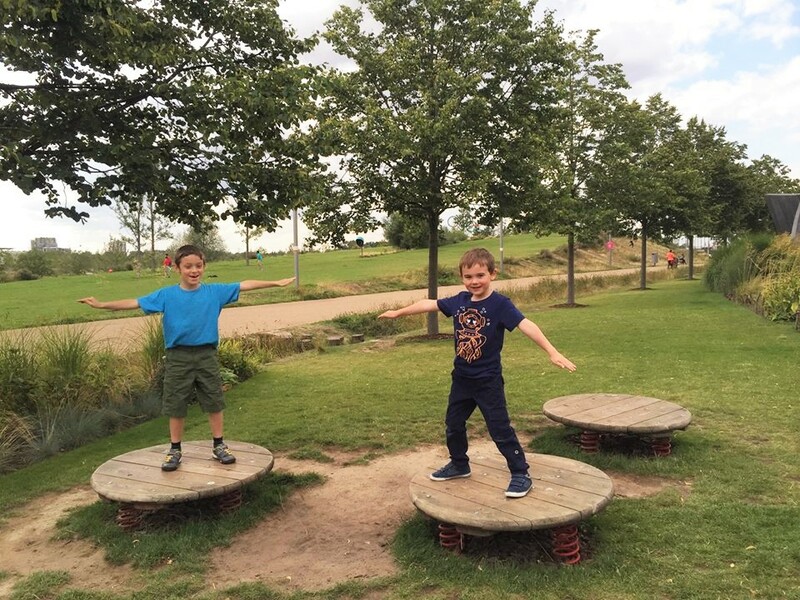 We had two magnets printed for £20 and got a code to download these two photos online. You will see them above, the pilot and race track shots. They are pretty good photos. 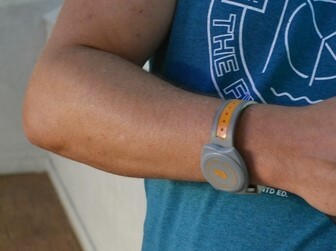 The last stage is check-out where you return your wristbands before saying goodbye. We loved it and Cooper loved it. It was good to see his confidence building as the day went on. It's expensive, but well worth it. If you're on a budget I would keep this top of your list (for 4-14 year old kids, although I can't see them being interested beyond 12 years old), then plan lots of free things. Save some money by just one of you taking them in (the other can have some free time) and while you are there take your own photos. 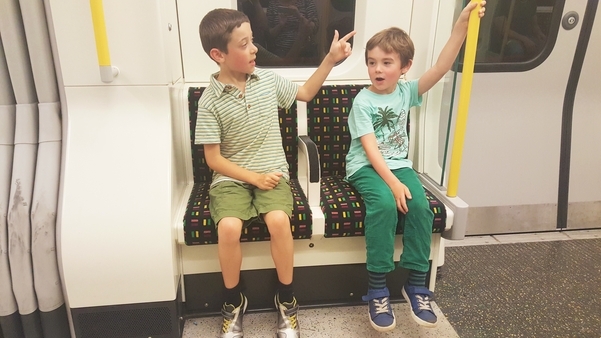 Ted & Cooper enjoying a tube ride. Ted (Sarah's son Maison Cupcake) knows everything about the underground. Smart cookie. This is our favourite of all the museums. It's modern, bright, interactive and they're always updating it. They have a new data section open this year that's really interesting. Also the IMAX cinema showings are rather fabulous. One of the biggest screens in Europe and they give you 3D glasses so the images really jump out at you. You feel totally immersed in the films. TIP: Go early when it's quiet in the museum and take your own snacks to the IMAX. 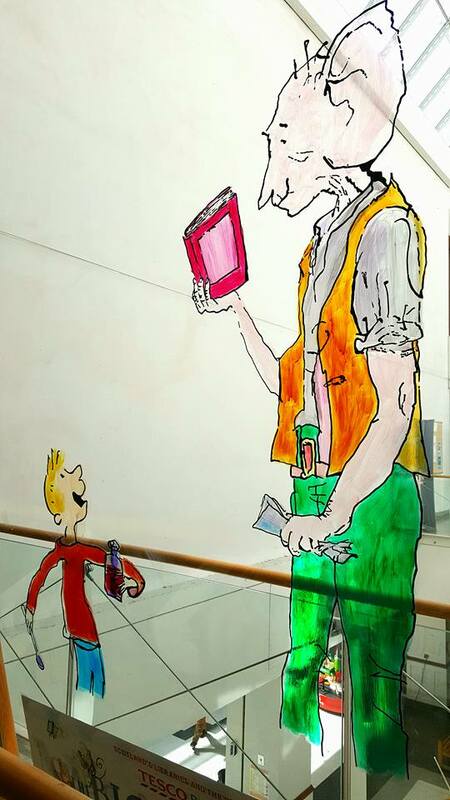 If you're a fan of Roald Dahl you'll know that the dream jars are from the BFG and this summer (9-31 August 2016) you can download and follow the map to find the 50 dream jars. Remember to take photos as you go. At the end of the summer the jars will be auctioned off for charity. Now don't be put off, it's had some bad press, but it's actually a great way of getting out and about as a family and exploring parks and public spaces. Just make sure you have plenty of data on your phone (you can usually upgrade for a month only if you ask) and set some ground rules on safety. I would also add some of your own rules, such as doing an activity and take photos at each location as well as collecting Pokemon. Cooper loves museums like this, although I have to say if you have the chance, visit the one in Glasgow, it's really special, it's free and has a ship moored outside the children can explore. Really modern and interesting. The London museum was fairly interesting. 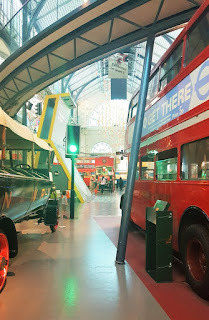 The history of the underground was worth going for and there were lots of other vehicles and facts for children to enjoy too. They're also given a card to stamp as they go round, which is a nice touch. Once you've been to the Transport Museum have a wander around Covent Garden. Your children will enjoy choosing a souvenir in the indoor market, have a wander around and watch some of the many street performers that provide entertainment in the area. TIP: Why not take a packed lunch or pick up sandwiches & a drink to enjoy while you sit on the steps and watch the show? This is a fabulous park for children. The photo is from the lead-up to the park. 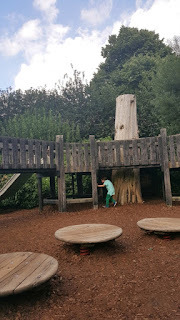 The actual park is full of wooden tree houses, wobbly bridges and sand pits. Ted and Cooper had a fabulous time climbing through the tree houses and exploring beneath them. I found this museum quite old-fashioned. The museum in Edinburgh is far superior. I also find the queues astounding. I would say go early or late to avoid the worst of them. We refused to wait an hour and a half to see the dinosaurs, but found the travelling exhibitions are excellent. You have to pay for these but they are modern, interactive and really interesting. 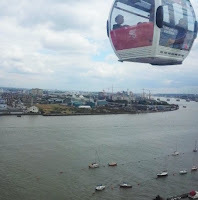 Taking a cable car ride over the Thames is such fun. 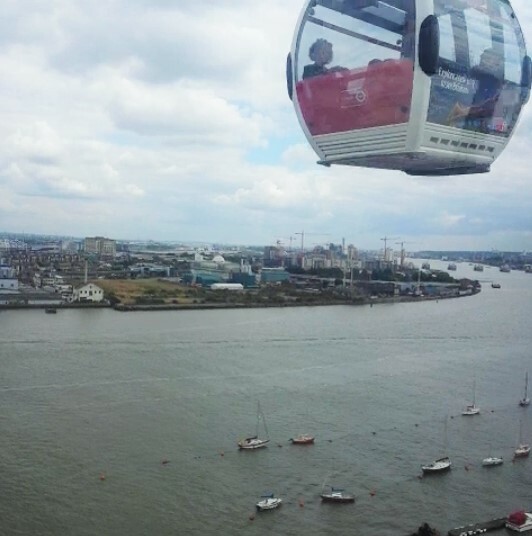 The ride has great views over London and is something a bit different. You can buy a single or return ticket and there are plenty of places to eat in the area. Another fabulous park for kids. Have a stroll through Kensington Gardens then visit the memorial park. There are toilets and a cafe at the entrance and then a maze of little parks all beautifully landscaped. The only downside is you can't really see from one part of the park to the next, so you really have to follow them around or they are out of sight before you know it. Taking a cruise along the Thames is fun and there are lots of stories about all the landmarks. We took the cruise from the Westminster dock to Greenwich. Once in Greenwich have a wander about and be sure to sample a nutella crepe from the street market. Well that's my list. I didn't include tube stations. Use google on your phone and you'll find your exact route from anywhere in London to where you're going. It tells you which tube to get, the time, how many stops and when to change. It makes life very, very easy. Just have a filled oyster card ready. I used about £16 over four days with a lot of travelling. Children travel free. 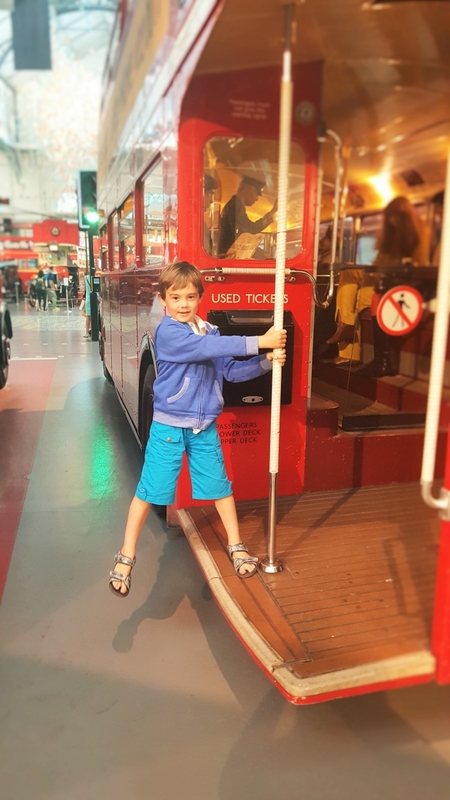 KidZania, London has teamed up with Tinned Tomatoes to offer two readers the chance to win one family ticket each to explore the 75,000 square foot kid-dedicated City at London’s Westfield Shopping Centre. Leave a comment telling me which of the jobs Cooper tried you think your children might enjoy then use the rafflecopter box below to enter. You will find some options for extra entries. world’s fastest-growing educational entertainment brands with 20 locations across five continents. 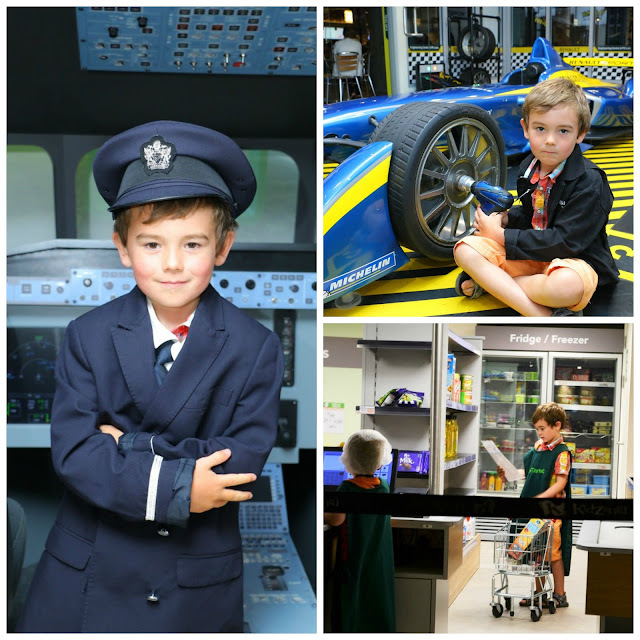 Disclosure: Kidzania invited us down for a visit and we loved it. I was not expected to write a positive review and any opinions expressed are my own. The other suggestions are our top picks too. 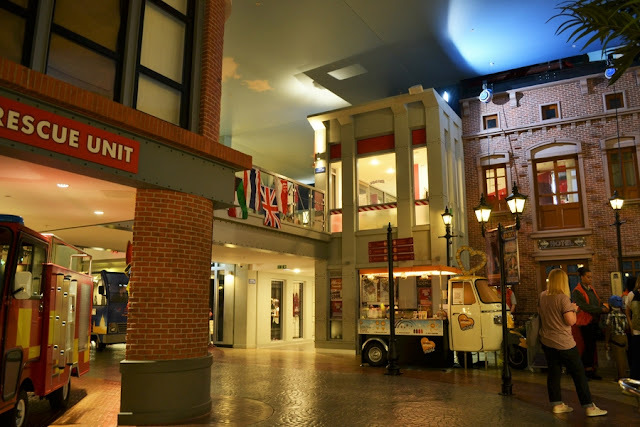 Kidzania looks AMAZING! Pity it's so expensive though. imagine putting three kids in! Eeek! Love the concept though. Cooper looks well chuffed! Yes it's definitely one to save for. It's really good fun. Cooper did enjoy it. How cute that kid can try out lots of different jobs. London has so many great museums and galleries, that there is something for every one. Yes it was brilliant and so much to do in London. Kidzania sounds fantastic!! I've never heard of it before but it looks like a brilliant place to spend the day. I would have loved that as a kid! You have had some real fun in London. There are so many activities to keep little ones busy. So much to do. We love visiting. My daughter would enjoy working in the supermarket. My children would absolutely love the pilot's job! Haha has she considered the zoo keeping properly or maybe she is thinking a toy zoo. They are so funny. 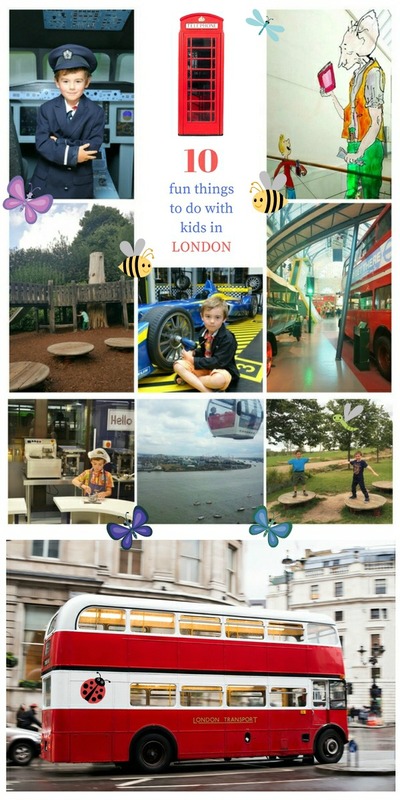 Yes there is loads to do in London for kids and lots of great parks. Daughter would love this. Never been. I'd love to take my nieces here. My son would love to be a pilot, he's fascinated with planes and would enjoy it su much. My son would definitely love to be a pilot he is obsessed!! I think they'd like to try at being a scientist, like Grandad. Jenny. My son would love the pilot's job. My kids would love to be pilots! It would be all about the firemen roles for my 2! I think my Grandson would love to be a pilot. MECHANICAL ENGINEER, I think my son Joshua would love this! They'd love the pilot, looks great! Pilot's job without a doubt! There are some really great ideas for days out here, thank you. I think my boys who are 3 and 7 would be really enjoy being a mechanical engineer, they love cars and would find that pretty exciting. 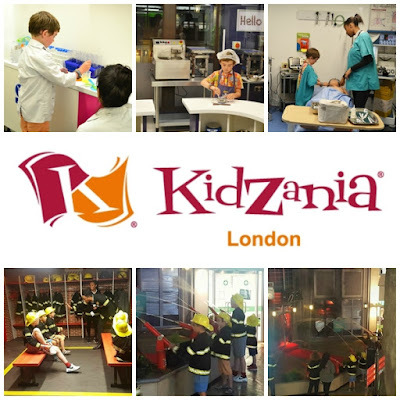 The whole Kidzania concept is quite amazing - I've known about it for sometime since I work in retail, and it is very popular on the continent. The commercial tie ins is an interesting dimension too. Ours would love the chocolate and smoothie making as they are both wannabie chefs! My daughter would love to be a pilot. My son Toby would love to be a pilot, he it totally obsessed with planes at the moment. Last year he was into bin tracks so I prefer this year so far..
Amazing prize! My daughter would love to be a supermarket staff. My daughter would absolutely love this. She's always pretending to be different things such as a teacher, shop keeper and a doctor. 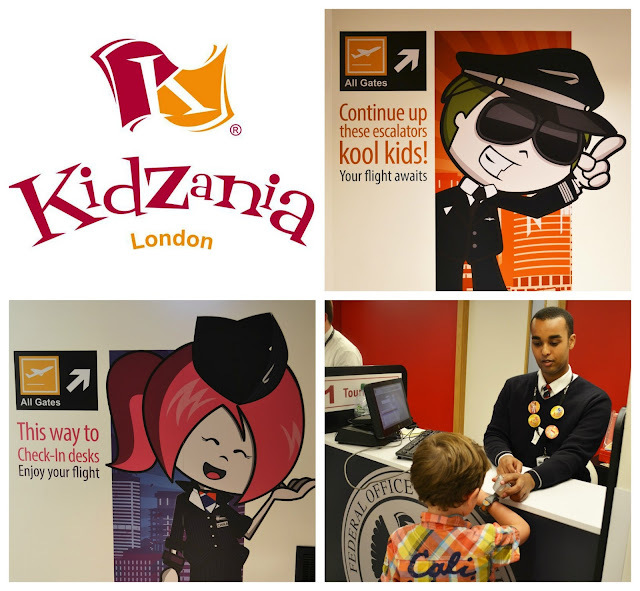 Kidzania looks amazing!